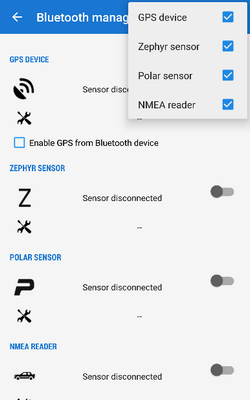 Use of bluetooth-connected devices (except external GPS units) is fully functional in Locus Map Pro only. In Locus Map Free, it is limited to 10 minutes. Locus Map can communicate with various Bluetooth-connected external devices - external GPS units, heart rate monitors, bicycle speed&cadence sensors, Zephyr sensors, Polar sensors and NMEA readers. Bluetooth manager displays their switches and settings.